It’s also possible to approach color and lighting through trial and error, by using the Adjust Color dialog in Photoshop. 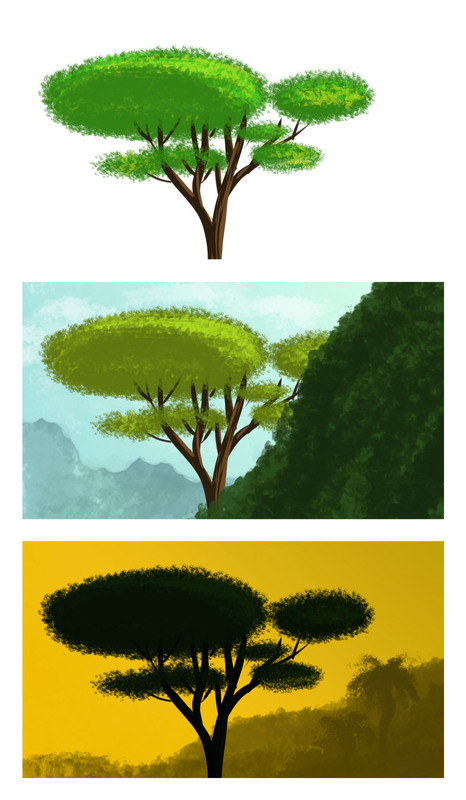 Here, I took the bright tree at the top, adjusted the colors with a time of day in mind and then tried to sketch in other environmental details as they would appear at that time of day. The middle image is what I imagine I might see on a day hike, rounding the trail from the shady side of the mountain and emerging into direct sunlight. The bottom image is of a daily experience in Los Angeles, looking westward during a short window of time when the low sun silhouettes trees and hills against the tinted sky and the atmospheric haze sets the layers apart. I’ve been noticing lighting details like this when I’m out an about, trying to commit them to memory or taking a picture for later study.